This is a fairly easy to figure out build but since it wasn't very popular i decided to post it to show how good Shield Pierce can be. Shout-out to veteran blademasters JoV and Superfluff who helped me in my early blademaster days which helped me understand that class combo. While testing i realized this build works with any number of gearing choices and hence makes it a very newbie friendly build that is tanky and can farm the end game. - The devotion route isn't meant to be followed in early levels and early level devotions depend on your situation. For example if you find yourself dying too much then get Turtle or Dryad. OR if you're lacking damage then get Falcon Swoop (use two handed weapon). When you think you are at a point where you have a good balance between attack and defense then respec into the actual build. It can be found in Royal Hive, it's a popular drop so don't worry. You'll get it, perfect rolls isn't necessary. Why is this build newbie friendly? 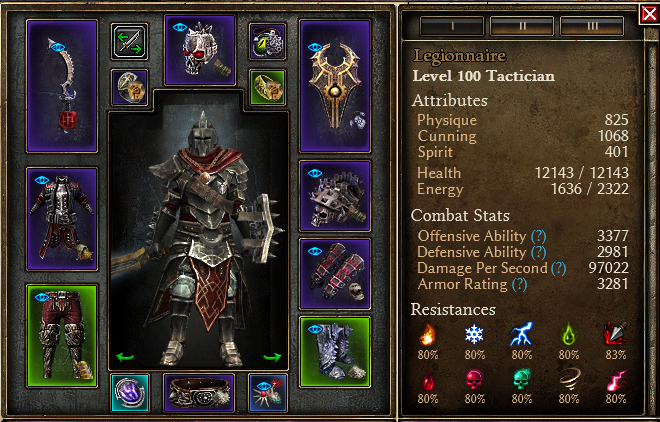 The ease in capping resistances, the flexibility in gearing/devotions make this build ideal for new players. Is there any point in playing the Blademaster if Tactician is better than it? The Tactician is hands down the better of the two. The tactician manages to get offense while still maintaining a highly defensive devotion setup including heal skills and damage absorption skills. Since Blademaster cannot compete against that, I decided to add more flavor to the Blademaster playstyle. 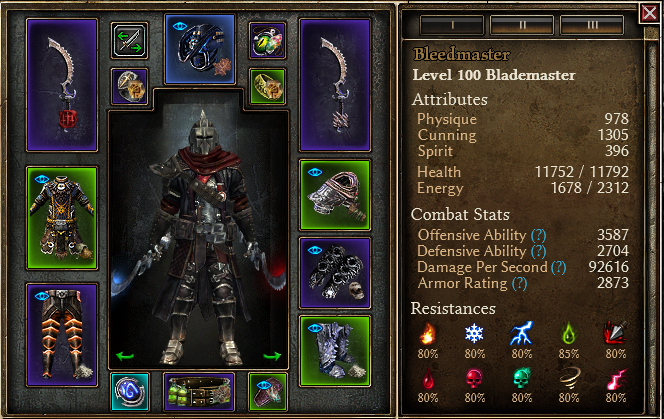 Tactician playstyle gets boring quickly but the Blademaster has procs that keep things fresh. So yes, I'd recommend trying both setups. Which is more newbie friendly among the Blademaster and Tactician setups? Both are equally newbie friendly but the Tactician's end game is much more polished than the Blademaster. Which item is key to this build? Dermapteran Slicer is a 1h sword that is dropped by the giant insectoids known as Dermapterans. Now this the central item to this build till you get Mythical Reaver's Claw. Unlike most forms of conversion, Physical to Pierce conversion is done through the percentage piercing value (denoted by %armor piercing) on the weapons. So for a weapon like Derm Slicer which has 50% Armor Piercing it would mean that 50% the Physical Damage will be dealt as Pierce Damage. The constellation Blades of Nadaan has a unique node that says "Increases Armor Piercing by 100%". This means the base armor piercing will be increased by 100%. Since Derm Slicers already have 50%, a 100% increase means we will deal 100% Pierce Damage. This high Pierce conversion is what makes it central to this build, going for anything with lesser than 50 % base Piercing value would make you end up with some leftover Physical damage. Is there any reason to be investing in Cunning? Pierce and Cunning have gone hand in hand before the nerfs. I am trying my best to continue the tradition. While not quite a 100% Cunning build, it still pretty heavy in cunning. Soldier provides us the physique cost reduction to wear heavy armor and direct physique scaling. Of course that's not the only reason, Cunning provides us valuable OA which is required for our Crits. Can the Tactician use the devotion route adopted by the Blademaster? Yes, it'd require some tweaks to gearing, augments and components. But it's doable. I won't recommend it as you'd loose out on defensive procs like Stone Form and Healing Rain. You'd also be trading Shieldmaiden's valuable shield stats. Is The Untouchable better than Siegebreaker? Why doesn't the Tactician use it? The Untouchable is usable on both the builds. It is in my experience better than Siegebreaker. Why doesn't the faction setup have Demrapteran Slicer in it? Because it's the faction setup meant to show which Faction Weapon will work here. How to grind faction rep? For faction rep farming always remember to buy Writs of the respective factions (whenever they're made available to you) to speed up your journey to Revered. If you have Mandates of the faction from another toon then use the shared stash to pass it your char for even faster faction rep farming. How flexible is the gearing? I tested using Valdun set and Markovian set. Both of them gave me solid results. Like I said before the key item here is the weapon's armor piercing ratio, the rest of the items are very flexible. Is Menhir's Bastion better than Oleron's Wrath? Is Assassin better than Oleron? Undoubtedly the nodes of Oleron are more attractive but the %bonus to Pierce damage and Cunning coupled with the shotgun proc make Assassin the go-to constellation. Again thanks to JoV and SuperFluff whose guidance in my early Blademaster days, that knowledge from back then eventually helped me plan this build. Also credits to Cepheus for recommending the shield "The Untouchable". Lastly, to Edelherb for taking the time to provide leveling tips to new players. The Dual Wield Variant can be found right below this post. The build works with almost an entirely different gear setup and the only thing needed is the Slicer, making it one of the least gear dependent builds. The purpose of this guide is to show how well it works. Just like this build the 2h Physical Forcewave Commando is also newbie friendly due to having tankiness, AoE and decent single target output and can farm the end game. I did have fun working on this and I hope you guys enjoy this. Last edited by Chthon; 04-04-2018 at 05:47 PM. A weird take on the classic Pierce DW Blademaster. Why not go with Unknown Soldier? The build's concept was experimental, I could get both Dying God and Unknown Soldier but doing so would force me to drop something I like. Have you tried Reforged Chains of Oleron or Bladebreaker Sash? Yes and it's a DPS loss, our current belt gives us a lot of flat damage by converting both Elemental and Acid damage sources. Why not use Warborn Pieces? Well, the classic Blademaster did not rely on that set. It's not a pierce set and I wanted to explore other gearing options and arrived at this setup. Also using Warborn is a sheet DPS loss. Are Dermapteran Slicers usable here? 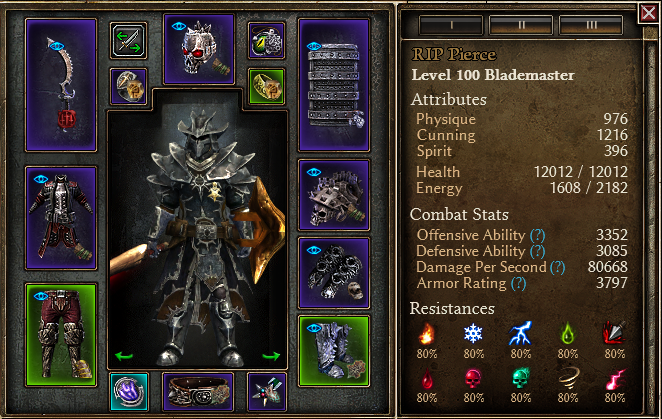 The build is a throwback to the old classic Cadence Blademaster posted by JoV back in vanilla. This build's performance was a surprise to me, I like it. I still prefer my Blind Assassin Shadow Striker but this one was fun to pilot. Last edited by Chthon; 04-04-2018 at 05:46 PM. Last edited by Chthon; 03-29-2017 at 07:03 PM. Have you tried using ring of steel as a nuke on this one? Turning shadow strike into one should also be possible, even if its nothing new and special. Ring of Steel main skill is supposed to be massive pierce damage dealer. If it can't pretend for the place of the cooldown skill in the build because cadence casting shadow on it there is something wrong with either one or the other. Reaver has +1 soldier and >30% piercing what more do you want? When you do not have double rare MIs. RoS is good i know but i lack plus skills.